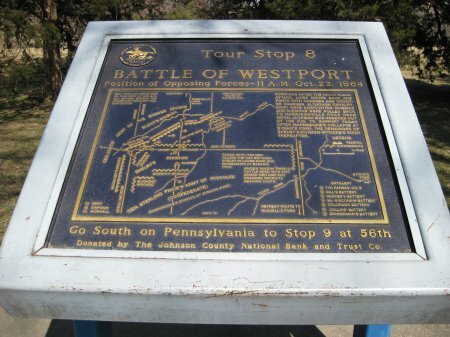 Directions to Stop #8: Tour Stop 8 is located in Loose Park just north of the intersection of Pennsylvania Avenue and 55th Street. It's best to walk from Tour Stop 7 because there is no convenient place to park near Tour Stop 8. It's just a little over one tenth of a mile to the next stop. Follow the inner walking path which will curve around to the west. Tour Stop 8 will be easy to spot because there is a 10 Pound Parrott cannon at the tour stop. This tour stop is located in Kansas City, Missouri 64112. Description: You are standing at the location where Confederate Major General Sterling Price made his headquarters on the morning of October 23, 1864. Under a grove of large trees, Price discussed the days tactics with his division commanders. The initial confederate position (Tour Stop 5) was about a half mile to the north of this location. By noon, Price would have to abandon this spot and withdraw south because of the Union advances. 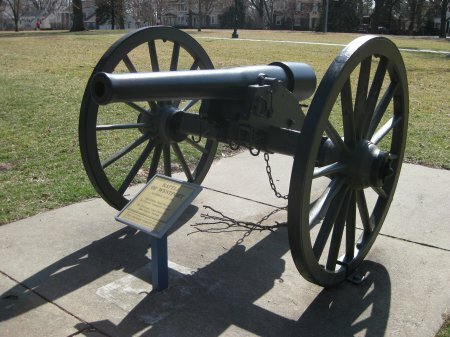 The cannon at this tour stop is 10 Pound Parrott Rifle and is similar to many of the guns in use on that day of fighting. There is also a series of eight posters that give an overview of Price's Raid into Missouri.